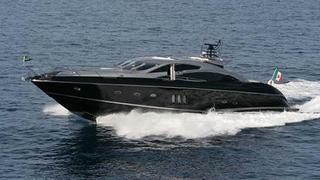 A call to Camper & Nicholsons confirms that Charles Ehrardt has closed on the sale of Sunseeker’s 25m motor yacht CNG. CNG is a Predator 82 delivered by the British superyacht yard in 2007 and her wide open spaces provide plenty of room to entertain, while winding back the saloon hard-top provides a genuine ‘wind-in-the-hair’ driving experience. The hull and superstructure are silver and black, with custom finishes on many of the extras and fittings. Inside, there is a large saloon and four staterooms for eight guests, as well as quarters for the crew. At the stern is a large bathing platform, wet bar, barbecue and tender garage. Twin 1800hp MTU engines propel CNG to an exhilarating top speed of 35 knots and she was asking €1.3 million.